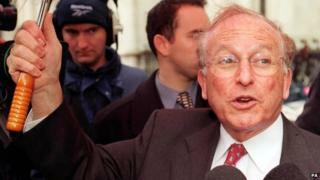 Image caption Lord Janner's family has said he is "entirely innocent"
Lord Janner, who was MP for Leicester West for 27 years, denies any wrongdoing and his family says he "is entirely innocent". He will face criminal proceedings relating to 22 allegations of historical sexual abuse against nine children during the 1960s, 1970s and 1980s. The case has been first listed for Westminster Magistrates' Court on 7 August. It was reviewed under the CPS Victims' Right to Review Scheme, which allows people to have their case looked at again regardless of who took the decision at the CPS not to prosecute. David Perry QC concluded that it was in the public interest to bring proceedings before a criminal court. Director of Public Prosecutions (DPP) Alison Saunders said: "I have always said that in my view this was an extremely difficult and borderline case because of the strong arguments on both sides. I have also always emphasised my concern for the complainants in this case. "I understood their need to be heard, which is why I contacted Justice Goddard to ensure that they could give evidence as part of the public inquiry. However, the review has concluded that this forum, albeit a public one, cannot substitute for the adjudication of the courts. "I accept the outcome of the review and will now be bringing this prosecution to allow for that adjudication to happen." Ms Saunders is the first DPP to have a major prosecuting decision reviewed and overturned. She faced calls to resign following her original decision but has told the BBC she will not do so. The announcement reverses Ms Saunders decision that the Cardiff-born peer's dementia meant he was not fit to stand trial and so it was not in the public interest for that to happen, despite there being sufficient evidence for a realistic prospect of convictions. A judge will now decide if Lord Janner is fit to stand trial. If not, he will face what is known as a "trial of the facts", where a court hears evidence from alleged victims and decides only if Lord Janner committed the physical acts of abuse. There will be no finding of guilt or conviction. In May, six of the complainants in the case requested a formal review which concluded that although there is sufficient evidence to prosecute, it is right to assume that Lord Janner will inevitably be found unfit to plead and therefore not fit to instruct his legal team, or challenge or give evidence in a trial. Solicitor Liz Dux, who represents some of the alleged victims, said: "This is a vindication of our efforts to challenge the DPP's original decision not to charge Janner, which was clearly not in the interest of justice". "Our clients have waited long enough for their very serious allegations to be brought before a court. They have felt deeply frustrated by the criminal justice system." There are only three possible outcomes from a trial of the facts. They are a hospital order, a supervision order or an absolute discharge. The jury can only make a finding that the defendant did the particular physical act. There cannot be a verdict of guilty. Such a trial recently took place in the case of the former Luton South MP Margaret Moran, who was accused of falsely claiming more than £53,000 in parliamentary expenses. She was given a two-year supervision order. In Lord Janner's case, the process would involve the alleged victims giving evidence. A trial of the facts would most likely be strenuously opposed by Lord Janner's legal team, who would argue it was an abuse of the court process to subject him to any sort of trial where there had been so much adverse pre-trial publicity. Labour MP Simon Danczuk, who has campaigned on historical child abuse cases, called on the DPP to quit. He said: "I think Alison Saunders has brought the criminal justice system into disrepute, and I don't say that lightly. It was just a cold decision, it didn't take into account the alleged victims in this case. "There was a lot of public interest in it and she failed to accept that. This decision today actually shows she got it wrong, and she has really dented public confidence in the criminal justice system." However, Lord Macdonald, who was DPP between 2003 and 2008, came to Ms Saunders' defence. He said: "Plenty of very eminent lawyers think that Alison Saunders made the right decision. The inquiry has corrected her but I don't myself think this should be a resigning issue for her." Police condemned the original CPS decision as "wrong", and the Labour Party has suspended the peer.